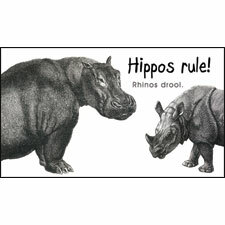 Enjoy a little whimsy every day with our "Hippos Rule, Rhinos Drool" magnet. Magnet is printed in black and white on a flat magnetic backing and measures about 2" x 3". This makes a fun little gift or stocking stuffer and is perfect for your refrigerator collection! Our magnet is a Hippo Mojo Exclusive which means you won't find it anywhere else!